It seems as if everyone is recycling these days. Not only is it good for the environment, by reducing the amount of trash in our local landfills, but it is also good for our economy, returning scrap materials back into the production cycle to create new products. Scrap metal is the most widely recycled material today, coming from many different sources such as manufacturers, offices and individuals. If you have ever recycled metal materials from your home or business, you have probably wondered what happens to your items after you drop them off. The entire process starts at the recycling plant. Items are gathered, collected and brought to your local recycling center. The recycling center buys the materials from the business or individual by weight. Once the items have been separated and sorted, they are ready for processing. Scrap metal needs to be sorted from the other recyclable materials that it comes in with to the recycling center. Items such as plastics, wood, rubber, paper, ferrous (magnetic) and non-ferrous (non-magnetic) metals all need to be processed in different ways. The items are usually separated upon receipt and then sorted further by shredding the items in an industrial-strength shredder, and then sifting them or removing the ferrous materials with a magnet. Once the items are sorted and separated, the scrap metal will be put into an extremely hot blast furnace. This part of the process not only liquefies the metal so it can be cast into molds for the creation of new products, but it also works to destroy any impurities that might still be in the scrap. 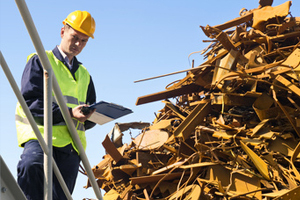 Once the scrap metals have been processed and made into clean, refined materials, they are sent off to manufacturing plants to be made into new products. Your scrap metals can be made into signs, key holders, decorative items and other commercial products. The metal structure and building industries also use recycled scrap metals in their products. Sheds, barns, commercial buildings, farm structures, carports, cabinets, hangers and more can be made from these materials. Artists also love using recycled scrap metal in their designs. Wall art, sculptures, large outdoor displays and more can all be created with a unique combination of recycled materials. There are lots of ways to use metal items in your garden or to add curb appeal to your home. Light posts and fences, lanterns, gazebos, trellises and other pieces are regularly created with recycled metal materials. Cell phones, computers, televisions and other electronic products can all be made with a combination of recycled materials. In addition to the products themselves, the accessories that go with them, such as television stands, mounts and desks can all be made from scrap metals. Believe it or not, common household appliances such as washing machines, dryers, refrigerators, stoves, freezers and more can all be made from recycled metals. The steel casings for these machines have been made from recycled materials for many years with much success. There are many different parts that go into making an automobile. Many of those parts and even the body of the vehicle can be made from recycled scrap metals. There are many different uses for recycled metal and there are even more benefits that we as individuals, consumers and business owners can get from recycling and using products that are made from recycled materials. The products made from recycled metals are just as strong and durable as products that are made from raw materials. Recycled materials cost less to make, create less carbon gasses during production and work to remove more items from our landfills. Every item you buy that has been made from recycled materials helps to keep our planet clean and green.